Idtagsonline.com offers 2 options: one for individuals who do not have web sites and another for individuals or organizations who own web sites. 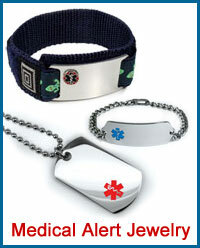 Both options will provide Medical ID jewelry and generate an income. Discount 15% applies to all affiliates. Option 1. Preferable for anybody who does not own a web site. Minimum Order Quantity: 10 pieces. If someone is creating and selling beaded bracelets and is interested to order only engraved ID tags (or metal plates), we have an economical option. It applies only for minimum quantity order of 10 pieces. We will provide you with engraved stainless steel ID tags, assembled with jump rings if applied, and curved for wrist wear. Please refer to the following page for list prices. Free shipping is part of the offer. This would be a regular USPS service with 5 business days delivery. If you need faster delivery, please refer to "Shipping and Returns" page for corresponding rates. If a large quantity of plates is required (100 pieces and more) we can provide an additional discount, which will depend on the amount of labor that will be required to fulfill an order. Option 2. Preferable for individuals and organizations who own a web site and have ability to add a link or banner to web page. 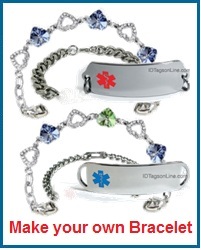 This will generate income by redirecting visitors to our Medical Alert ID Jewelry store. The program works this way. When you sign for an affiliate program, we provide you with a Banner, Text ad or Hover ad, which you place on your web site. When your web site visitors click on this ad and buy our product, we contribute 20% commissions to your account. This will generate commissions every time this visitor will buy from us. We, also, provide you with a monitoring tool on special web page, where you can control and get report of your traffic and commissions. Once a month and when amount is greater of $100 we will send you a check or PayPal transfer, regardless of what you choose. Practically, affiliates have to be focused only on marketing activities. Rest of the business from accepting an order to the shipping directly to the customer we take in our hands. We do offer top commissions in the industry and looking forward to build long term productive relationship with all our affiliates.